An arcade, metroidvania genre action game developed by Insomniac Games studio, known for, among others, Sunset Overdrive, and series such as Spyro, or Rachet & Clank. In Song of the Deep, we assume the role of Merryn, whose father has disappeared during a fishing trip. 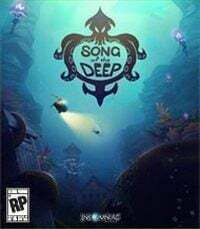 Song of the Deep for PC, PS4 and XONE is an another game from Insomniac Games studio, which is responsible for such titles as Spyro (some of the first installments of the series), Rachet & Clank series, or Sunset Overdrive. The publisher side of the project had been taken by GameStop retail stores. In Song of the Deep for PC, PS4 and XONE we assume the role of a girl called Merryn, whose father had disappeared during a fishing trip. One day, she has a dream that her father has been imprisoned in the sea depths. The little heroine decides to build a small submarine from available parts, and embarks on a rescue mission. Song of the Deep is a metroidvania styled action game. Because of that, during the gameplay we traverse a non-linear world, divided into various locations, including ruins of an ancient city and a garden. The developers prepared various challenges, consisting of, for example, creating passageways and of course fighting the encountered enemies, including bosses. Fortunately, we have the ability to improve our submarine during the gameplay, receiving new abilities, which allows for, among others, to get through to the previously unavailable locations. All of that is seen from a 2D perspective. Insomniac Games studio prepared a pleasant 2,5D graphical layer, which pleases the eye mainly thanks to varied locations. During the gameplay, we are accompanied by various visuals and charming lighting effects.